New FIDLAR video: Are You High? Presumably from their third album, hopefully out sometime soon, probably on Mom+Pop. I love this band. They blew me away the first time I saw them at Lollapalooza in 2016, they were equally great at Riot Fest last year, and I’ve been following them ever since. They’ve released a few covers (Beastie Boys, Nirvana since then, Pink Floyd) and a couple of originals, but I’m looking forward to the release of their third full length. Still no info on when that’s going to happen but “Are You High?” is a promising sign. It’s a little more melodic and less screamy than their previous original single, “Alcohol,” but it’s still rambunctious and obnoxious, just the way we like them. Stay strong, dog. Life’s a risk worth taking. 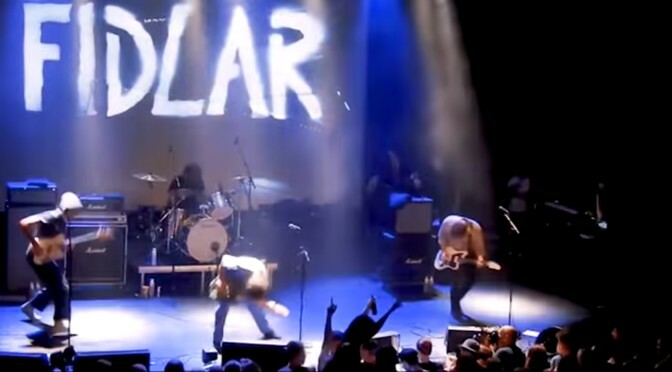 FIDLAR: web, twitter, amazon, apple, spotify, wiki. Animation by Character World/Jonathan Atchley. Single out now on Mom+Pop.